Drinking wine at a picnic usually involves a trade-off: Either spend the entire time protecting your unstable glass from tipping over in a field or suffer the indignity of drinking out of a red Solo cup. 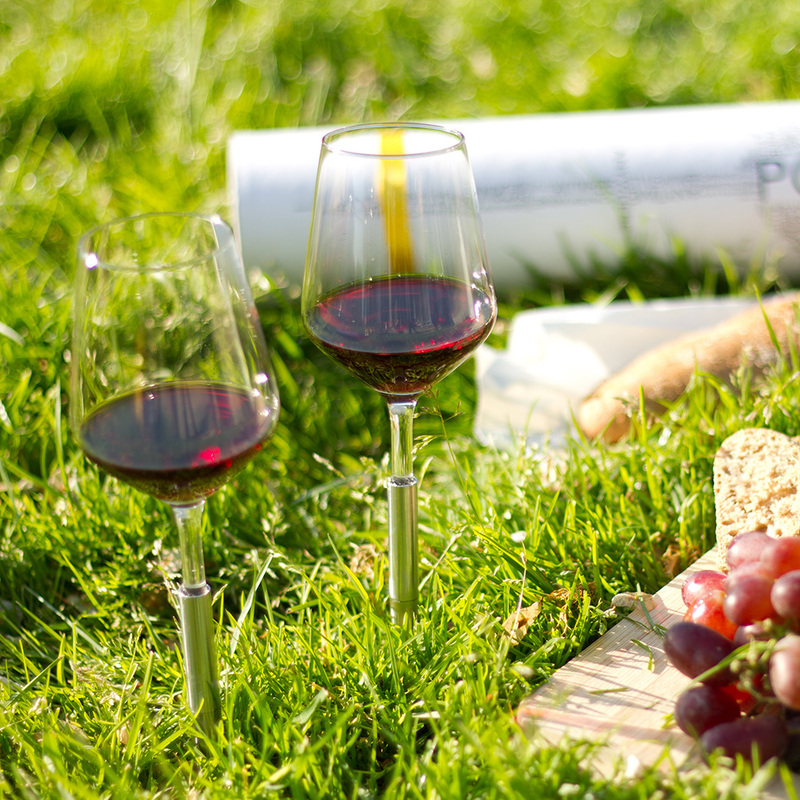 Romanian architect Ramona Enache didn’t care for either of those options so she came up with a genius idea—a stemmed wine glass with that you can stick directly into the grass. "Everything started almost a year ago while I was enjoying a glass of wine with friends in one of the beautiful parks of Amsterdam. I dislike drinking wine from plastic cups or straight from the bottle, so I almost always carried real wine glasses along. They're never really stable, so after spilling the precious liquid several times in the grass, I had a eureka moment and realized I needed a glass that I could pin in the ground," she says. Using improvised materials, Enache made nearly 200 glasses by hand over six months, experimenting with pipes, stakes and stem length before perfecting her design. Her POINTER glasses have been sent to 11 different countries on 3 continents to date, but to streamline the process and make the production more efficient, she launched a Kickstarter campaign last week. For $40 you get your own set of glasses as a reward. It makes sense that Enache would grow up to design wine glasses, since wine has had an important role in her life since childhood: "My grandparents had vineyards, and it was part of our family ritual to take care of it in spring and pick the grapes in autumn. Of course, the most fun was always actually making the wine and tasting the results in all its phases, from the very sweet juice in the beginning to the mature wine in the winter. I guess that's where I got my habits from." After the Kickstarter campaign finishes, the glasses will be sold online here. What's the Deal with Natural Wine?